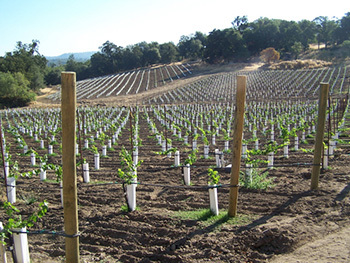 Ag Tech Services Inc. specializes in the management and development of premium vineyard estates. The roots of Murphy Vineyards come from Vineyard Management. After Peter graduated college with a degree in Fermentation Science he practiced many different venues of the wine industry. Everything from a cellar worker to a farming supervisor. In 1987 Peter and Nancy Murphy established Ag Tech Services Inc. ATS is a vineyard management and development company that specializes in small private estates. With years of experience in farming and other aspects of the wine industry ATS helped many small vineyards and wine operations get started. ATS developed the vineyards that would later make wine for Hartwell Vineyards, Bryant Family Vineyards, Bravante Vineyards, Emilio's Terrace, Engel Family Vineyards, Lamborn Family Vineyards, Hestan Vineyards, Lail Vineyards, Donna del Cielo (McGillivray Vineyards), Domaine de Terre Rough (Easton Vineyards), Crane Family Vineyards and other premium wine estates. Today ATS continues to manage and develop ranches in the Napa Valley and the Sierra Foothills. In the mid 90's, ATS started venturing outside the Napa Valley and developing the same style ranches in the Sierra Foothills. Up and down the appellation ATS has developed several vineyards in the Amador, Placer and Nevada Counties.